For centuries Nidderdale was a mixed farming area, but because of the wet climate in the upper dale the only cereal crop which could ripen satisfactorily was oats. The crop thus formed the staple diet of many people and the straw helped to feed the stock. 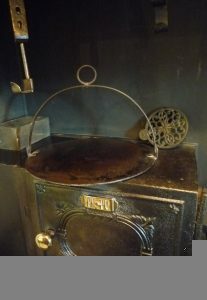 Having been heated on the hot surface of the kitchen range this iron griddle, with its heavy plate and hooped over-handle for safe carrying, was used primarily for making oat cakes. Oats were ground to meal on stone querns and blended with a little fat and water into a paste, then patted out and baked on the hearth stone using a griddle. Farmers’ wives could make as many as 15 dozen, and they were often eaten with white cheese and a light home-brewed beer.